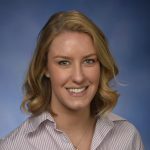 Elizabeth Kutter is a two time graduate of Michigan State University, first with a bachelor’s degree in Political Science and later with a Juris Doctor. She currently works for the House Republican Policy Office covering Health Policy and the traditional Department of Community Health side of the Michigan Department of Health and Human Services Budget. Elizabeth began with the Policy Office in January of 2015 covering a variety of topics including Military and Veterans Affairs, Higher Education, Community Colleges, Natural Resources, Tourism, Oversight, Financial Services, and Joint Capital Outlay. Prior to working for the House of Representatives, Elizabeth spent time living in Washington, D.C. interning for Congressman Dan Benishek, M.D., and later working for the National Rifle Association. Elizabeth’s passion for public health stems from a long family history of public health champions, and she is looking forward to honing her skills through the CHRT Fellowship. Elizabeth currently resides in Farmington Hills with her husband, Lee, and two dogs, Judge and Jury. She enjoys spending time outdoors – especially with her husband and dogs, cooking, baking, and reading.